The Manor of Alston Moor lies almost wholly within the county of Cumbria comprising some 45 square miles of moorland, hills and valleys, predominantly at altitudes between 1000ft and 2000ft. Mining is documented back to 1130 although it is believed that the Romans worked the lead deposits. Alston is the highest market town in England with streets “Inconveniently steep and narrow”. his actions he was beheaded in 1716 and stripped of his titles and lands. The mining rights then passed to the Commissioners of Greenwich hospital. The actual mining process was dominated by two companies, the London Lead Company and the Blackett family. The Governor and Company for Smelting down lead with sea coal and pit coal was set up in 1692 and after merging with the Ryton Company became known as the London Lead Company. As a Quaker company they took great interest in the welfare of their workers through welfare schemes, education and social amenities, the Nenthead library being a fine example of this philanthropy. They worked many of the mines, drove the Nentforce level and smelted ores here until they relinquished their leases in 1882. For all but the later part of that period lead and as a by-product silver were mined but towards the end zinc increasingly became important. The Blackett family began their association with the Allendale mines when Sir William Blackett took out a lease in 1667 and it was not until 1884 when falling yields and low lead prices caused them finally to surrender their lease. It was at one of their smelters that the Pattinson process for silver extraction was invented which increased the yield of silver from lead ore. 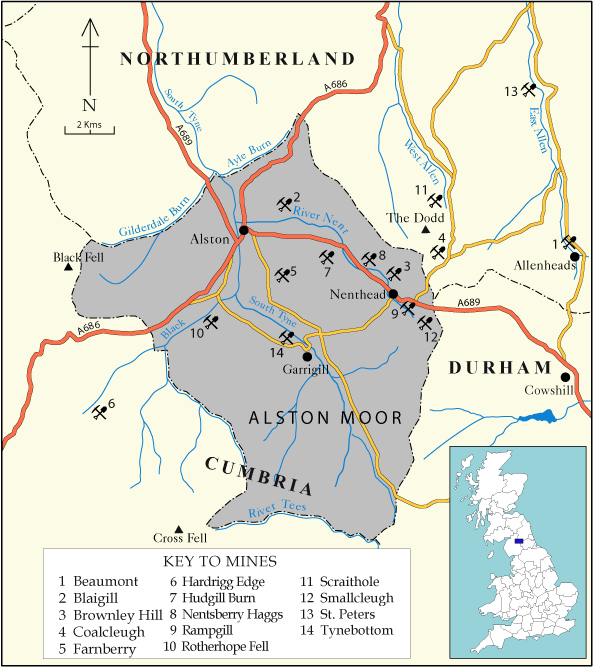 Subsequently the Alston mines were worked by various owners; the Nenthead and Tynedale Lead and Zinc Company from 1882-1896, followed by the Vieille Montagne Company of Belgium who relinquished their lease in 1949. 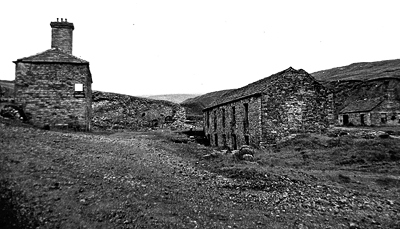 The Anglo Austral Mines Co. then took over the leases, converted the plant at Nenthead to process fluorite, the feed coming mainly from Rotherhope Fell mine. This operation continued until 1960 when underground mining of any significance in the area ended. The primary mineralisation in the area differs from that in Weardale with increased zinc mineralisation leading to many rich mixed lead/zinc oreshoots. Copper ores are rare with only relatively significant amounts around Tynehead and Crossgill. Gangue minerals show a lateral zoning in the North Pennine Orefield of which Alston Moor is part. The central fluorite zone extends into the east and south of the Alston area with barite and witherite becoming more evident around the periphery of the area. In Northumberland, to the north east of Alston Moor, witherite was of economic importance. Fluorite twinning appears also to be less common than in Weardale and the predominant colours here are purple, amber and colourless. Many of the mines worked ‘flat’ deposits, horizontal zones of mineralisation alongside but separate from the veins and as in Weardale mainly occurring in the Great Limestone. These flats contained many cavities and are the source of most of the mineral specimens from the area. 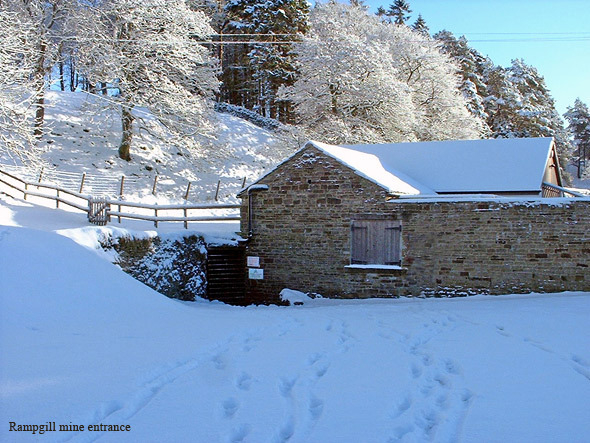 Nenthead had until recently a Mines Heritage centre run by a charitable trust which was dedicated to both showing and telling the ‘story’ of the mineral mining past of the North Pennines. However it is currently (2012) closed but attempts are being made to secure its long term future. In June 2003, the North Pennines AONB (Area of Outstanding Natural Beauty) became Britain’s first ‘European Geopark’. Permission is needed to visit any of the mines mentioned below and underground trips are only possible through organised visits arranged by the local mining organisations. Opened by the British Steel Corporation in 1969 and known for specimens of lustrous wine coloured fluorite often partially covered with sphalerite and siderite found in the early 70’s from the flats off Diana vein. These were a pale green colour when first brought out. Opaque purple fluorite cubes from Henry’s vein also occurred. The mine closed in 1979. 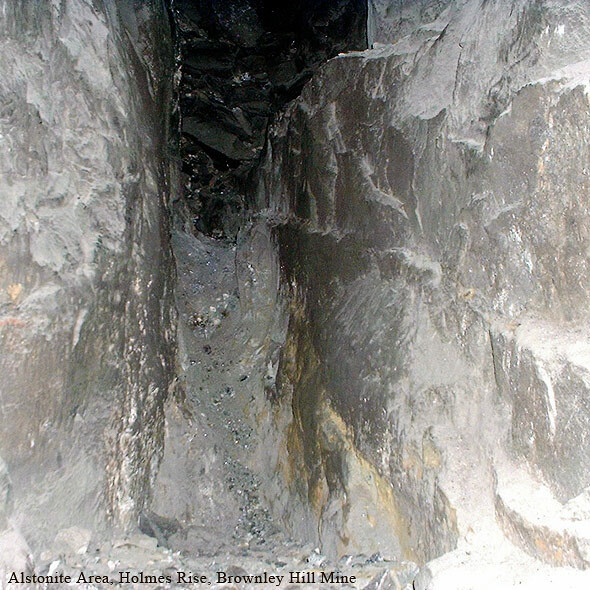 The same veins had been previously worked for lead at the Allenheads mine. Similar older mineral specimens probably originate from this mine as Diana vein was first discovered in 1792. Blaigill being the type-locality for this mineral. In the past, the tips have produced good specimens of white to colourless prismatic crystals to one inch particularly when material was periodically removed for road material. Occasional smithsonite, calcite and aragonite specimens. Closed sometime around 1895 and is now a SSSI. One of the best locations for sphalerite specimens and occasional exceptional groupings intergrown with modified galena crystals. It is also a classic locality for white to grey lustrous alstonite crystals and a spectacular find of pink alstonite was made about 10 years ago. Semi-transparent calcite crystals have been found in recent years, as have amber fluorite specimens from Jug vein and millerite sprays from the limestone / sandstone contact. Brianyoungite, a post mining mineral has also been found here, Brownley Hill mine being the type locality for this and alstonite. Closed in 1936. (For further information on the minerals see Mineralogical Record Vol. 31, No. 3). This deposit with extensive flats was being worked as early as 1735 from Gudhamgill High level but 19th century workings were via the same horse level (Bloomsberry) as Brownley Hill mine. Although the workings are no longer accessible it is thought to be the location for the attractive amber fluorite/sphalerite groups that came out around the period 1910-1920. Specimens can be distinguished from Hilton material by the sphalerite association and the lack of twinning. 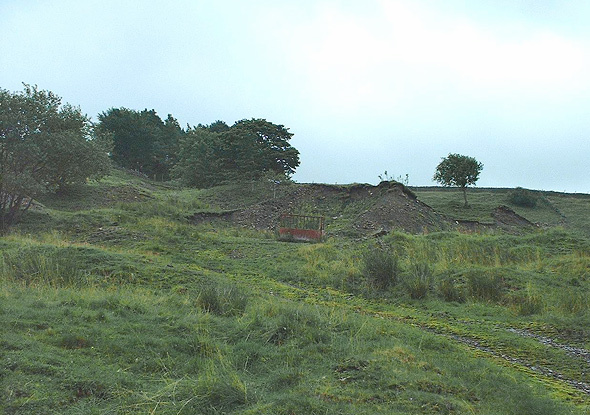 Worked flats just outside the Alston Moor area primarily for sphalerite. Old surface shafts suggests extensive fluorite mineralisation also with the occasional attractive group of purple fluorite crystals being found. Situated some 3 miles north of Hexham and close to Hadrian’s Wall. 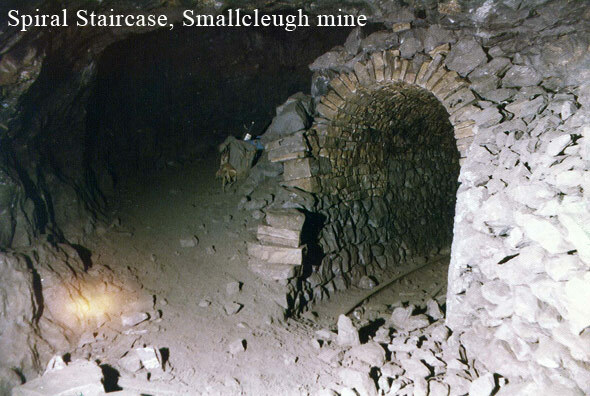 It is an old mine, known to have been worked since 1611 for lead ore and from 1842 for witherite. Some of the finest specimens of witherite have been found here consisting of classic pseudo-hexagonal prismatic crystals with stepped sided, and occasionally intergrown with alstonite crystals. It closed in 1912 although Settlingstones Mines Ltd. carried out some test borings in 1958-9. Galena, cerussite, calcite and aragonite were found here but mineralogically known for some of the best North of England botryoidal smithsonites of a grey to yellow colour. Closed 1882. Now designated a North Pennines Geodiversity site. Famous for epitomising the vicissitudes of mining. In 1808 the Flow Edge Mining Company, after working the mine for 4 years, abandoned the workings, finding only two weak veins. John and Jacob Wilson took over the lease in 1812 and in less than two years hit a vein of solid cerussite which at one point was 20 feet wide. The deposit was strongly oxidised containing, as well as cerussite; hydrozincite, smithsonite, aragonite, calcite, galena and siderite although only very rarely do specimens from here come on the market. Closed 1870. Worked numerous veins for lead/zinc, and as the veins were worked NE into Northumberland, barium ores. The main access level is driven from the side of the Alston-Nenthead road. Although production ended in 1953, exploration by collectors has subsequently revealed some excellent mineral specimens. Sphalerite from here is lustrous and smaller crystals are transparent (Ruby sphalerite). Admiralty flats and the Wellhope shaft area have produced possibly the finest specimens of honey coloured barytocalcite. Good witherite and barite crystal groups have also been found often etched with the surface of the witherite altering to barite. One particular pocket found in the early 1990’s produced well formed pseudomorphs of barite after alstonite on beds of lustrous sphalerite and galena crystals. Recently the main access level has collapsed. Now a North Pennines Geodiversity site. Originally worked in the 18th century it proved to be a very rich mine, first for lead and then under the Vieille Montagne Company for zinc. With extensive flats in the Great limestone good galena and sphalerite specimens occurred as have interesting quartz epimorphs after fluorite. Its proximity to the zonal fluorite/barite transition zone is well shown by purple fluorite cubes coated with globular secondary barite. Now a North Pennines Geodiversity site. This produced some of the best fluorite specimens in the area with lustrous twinned purple crystals up to 2 inches. The Natural History Museum in London has some excellent examples of bi-coloured purple/amber twinned crystals. Extensive vein and flat deposits were found and worked between 1827 and 1948. Galena, quartz, pyrite, calcite, marcasite and a little chalcopyrite and sphalerite are also recorded from here, specimens of these occasionally coming onto the market. Scraithole level entrance lies in Northumberland but worked veins extending into the Alston Moor area. Originally opened in 1820 for lead it was relatively unsuccessful, closing in 1835, the deposit consisting primarily of sphalerite, witherite and barytes. The level linked into the Gudhamgill vein with its associated flats. Subsequently it was worked from 1861-1878 and in recent years from 1970-1974 and 1980-1981. Collectors found good specimens of honey coloured barytocalcite here in the 1980’s and attractive witherite specimens. Famous for beautiful apple-green fluorite, specimens of which are in the collection of the Natural History Museum, London. Exploration of the mine via the main shaft was carried out in recent years but failed to find any. However numerous straw to light brown fluorite groups were collected some of excellent quality with cubes up to 10cms (4”) and often partially coated with siderite. In the area between Hexham and Haydon Bridge a number of mines exploited the rich barite/witherite oreshoots found there. Settlingstones worked a near pure witherite deposit becoming the largest producer of witherite in the world. Witherite specimens from here tend to form domes of aggregated small elongated crystals sometimes partially coated with pearly white barite crystals. The mine closed in 1970. This was a mecca for collectors and mine explorers in the 1970’s and 1980’s with many miles of mine workings to explore. Fine sphalerite specimens were found in the Hydraulic shaft area whilst other flat deposits produced excellent galena specimens and occasional calcite, pyrite, or chalcopyrite specimens on dolomite. Fluorite is found here but is not common. Designated a SSSI. Worked Flats on Dryburn Washpool vein where the Tynebottom limestone has been replaced with quartz Cavities in the flats produced specimens of this mineral and flowstone, often coloured red and green from traces of cobalt. Erythrite and calcite specimens were also found, the latter usually in mud filled vugs. Designated a SSSI.